It's a great day to be a taum. Just taums being taums. Whether you're just flying by, or nesting with us awhile, we appreciate the continued support! Welcome & Heed the warnings! Hello Taumbois, Taumlet(lets) and Friends! And welcome to April’s event! You know that Easter is just around the corner when you start seeing those pastel, sugary treats popping up in stores! But what if I told you those colorful, marshmallowy candies could be good for something else besides eating? I hope you’re feeling lucky this month because the event this time is all for the high rollers! Marshmallow taums may be good for eating but, they’re also good for bribing if you’d like to take a gamble! The merchant for this month’s event is a bit fickle, they don’t like opening up for shop until the last few days of April. But! They have a soft spot for those colorful, sugary treats and mayyy be willing to let you try and roll their dice to see if you are able to nab one of their shop items early, with a good bribe of a few sweets of course. TAUM MARKETPLACEWe are wanting to try a different approach to people looking to trade/sell/look for taums in the TaumDen. Multiple journals are being submitted with the same content without the previous being removed. We want to try to curb this and make it one place for all this activity and easier for you to find what you need. I've (aetherdust) have seen the bagbean group use this format and it seems to be one that is working well, and we would like to see the same success here also. So for now we are going to try it out and see if it's a viable shift from the journal submissions. - Please only use this journal to list taums. - Once the transition is finished it will be hidden. or TRADE IN THIS JOURNAL ONLY . We also have a channel for trades and selling in our discord Gacha Trading areaThis is the Trading and Selling are Specifically made to the Gatcha taums! Also note you can change your taums design a little bit for the older adult version! But know you cannot change its colors or far too different from the baby. If you redesign remember to get approval first before posting! Be kind to each other below! Thank you! A little help! To make the taum website!SO I and another (His names Sigrath) Has been working behind the scenes to get the taums-den website up and running. 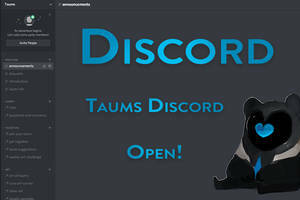 What we wanted to do is make it into a private little area for just us taum lovers out there! With the trading, selling, tracking database of something similiar to toyhouse/masterlist. You the taum owners would upload the taums you own onto the website, which will all be stored into a database all together. There they will be numbered and given their own profile pages. Where they will have all their data, from game play, awards, scores, artwork, and more. Then we will also have more fun elements such as Forums, multiplayer games, high score and more!